A few days ago I ranted a bit about the onerous rates of US data roaming for Canadians. I’ve heard dozens of horror stories about this since that post, including $30K bills for 2 days of use. I bought a T-Mobile MIFI device for $125, and a 5GB SIM for $50. Right now, though, you can buy the MIFI online for $25, as they’re having a promotion. I decided to do the math. I’ll have used this 5GB data plan for nearly a month, and according to T-Mobile’s (good, transparent) diagnostics, in that time I’ve used 1.9 GB of data. 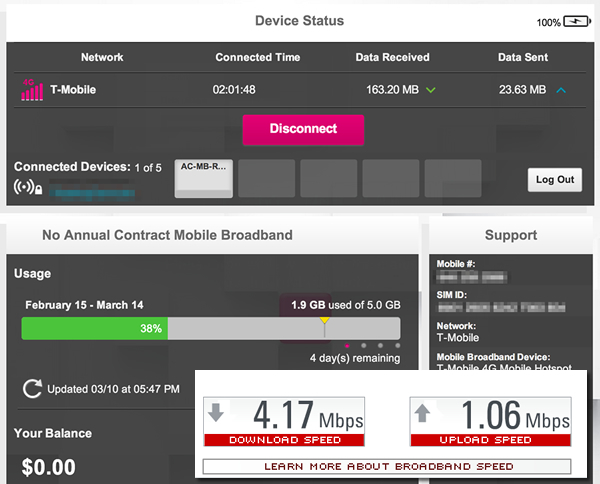 I’m getting roughly 4Mbps of data down—enough to watch a movie if I feel like it. I then compared this to Rogers’ current US data roaming rates. They were a bit hard to find by searching on Google—the page that’s indexed by the search engine (http://www.rogers.com/web/content/wireless-network/wn_usdataroaming) is blank. Even with the most preferential plan, I’d have been able to buy two MIFI devices with data plans. And now that I have a MIFI, my data costs me around 12% of the Rogers rates. Oh, and I’ve still got a few days at SXSW and in NYC. So don’t quote me on that 12%—it’ll get even better before I’m done. If this incenses you, you’re not alone. I wrote a bunch more about it in a previous post, but more than anything, I really want everyone to do this instead of consenting to the highway robbery that Canadian carriers get away with. It hurts Canadian business and holds back our technology growth, and it has to stop. Thanks for posting Alister – I’ve been ranting about this for the last few months. I haven’t used it but seems like a cool alternative. I hadn’t; it sounds interesting. Alistair – how / where did you buy the MiFi and the data sim? At a T-Mobile store or online? Mifi devices is the best thing to use….I have already using it. Thanks for this great post! Do you have any advice for someone traveling from the US to Toronto for a few weeks? – What might be the best option? – To purchase a T-mobile mifi in the US and then purchase data sim at a T-mobile store in Toronto? I also want to do the reverse.. I have a verizon mifi with 5G usage for $50 per month but occasional want to use it in Canada without huge roaming fees…. anyone out there have an answer? Canadian telcos and lawmakers are negotiating in secret. Do the carriers see this as a way to reclaim revenue they feel they’ve lost to the Internet? And should we treat Internet access as a public good, like healthcare, instead?